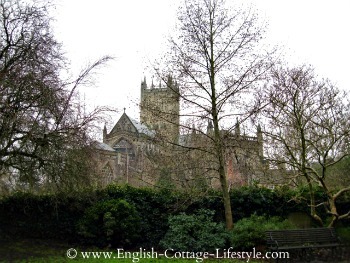 Wells Somerset is situated in the Mendip Hills in the South West region of England. This unspoilt Mediaeval City is nestled on the southern side of the Mendip Hills and is famous for its Cathedral. 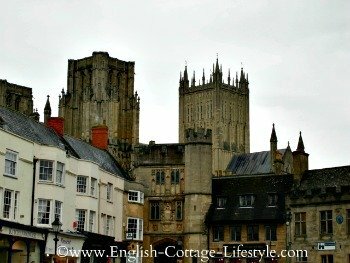 The City of Wells has approximately 12,000 inhabitants and is the smallest city in England, it is only because of the Cathedral that it can call its self a city. 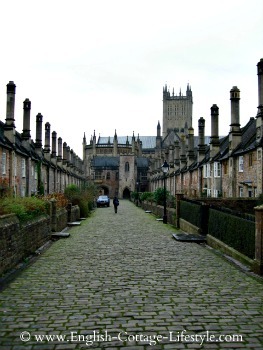 Wells has an intimate feel to it and is full of historical charm. The area was once a Roman settlement properly due to the springs for which wells is named but its history revolves around the cathedral which was begun in the 12th century and finished in the 14th. 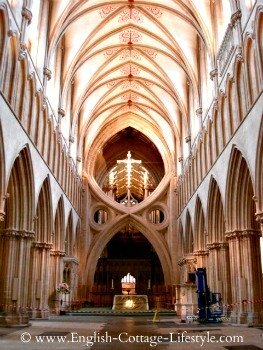 The stone of the Cathedral is made up of a mix of stone including; cream Doulting stone, Bath stone, white tufa rock and red Draycott marble all quarried locally in Somerset. As you walk inside the cathedral you will be greeted by the scissor arches. 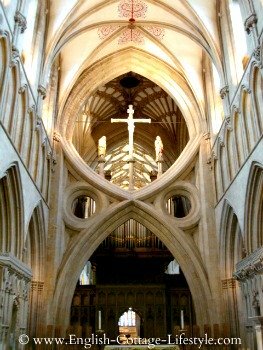 The scissor arches were built in 1338 beneath the central tower of the cathedral as a way to support the tower from tilting, they are a very distinctive feature of Wells cathedral. 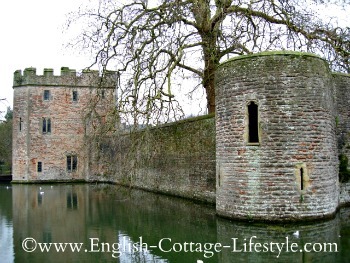 A fun way to discover the cathedral, Palace and the City is to go on the ‘Wells Moat Walk‘. When I was there it just happened to be the coldest day of the year and snowing and the walk was still enjoyable. It can be done in 30 minutes or a few hours depending on how long you spend in the cathedral, the palace or the pub! 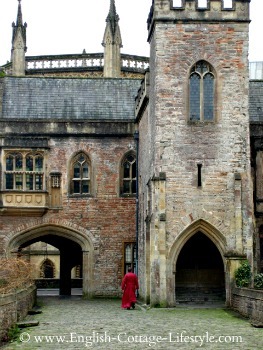 The main attractions along the walk include the marketplace, cathedral, Bishops Palace, Vicars Close and Wells and Mendip Museum. 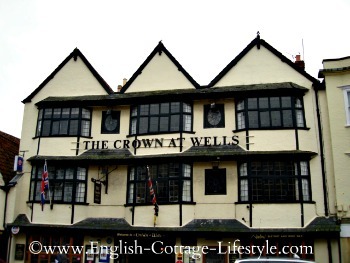 We stayed at the Crown at Wells Inn when we were here and had a great time. They have a pub and a separate Bistro with good local food. The Moat Walk begins in the marketplace. You can get a copy of the Moat walk map in the lobby area of the Inn. 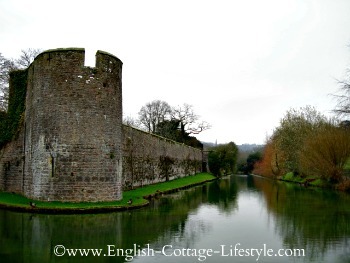 Wells Somerset: The Bishops Palace and Gardens. The home of the Bishops of Bath and Wells for over 800 years. The Palace has stunning Medieval architecture and immaculate gardens and on the grounds are the well springs that give Wells its name. Here you can stroll around the gardens, have a picnic, take photos of the cathedral or go on a guided tour; at 11.30 daily and included in the admission price. Visitors are welcome inside the Chapel and there is a restaurant and gift shop. They open at 10.30 am to 6pm Sunday to Friday and 10.30 am to 2pm on Saturdays. They close 24th December to 2nd January. 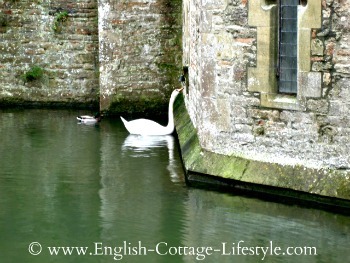 My favourite part was visiting the famous Wells swans on the Palace moat. The swans have been ringing a bell for food at the gatehouse for the last 150 years. The swan below rang the bell several times! 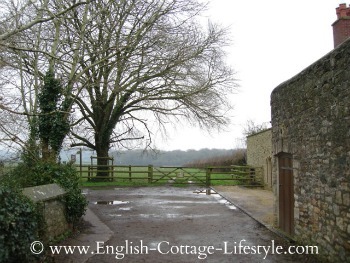 The Palace Fields are visable from the walk...countryside on the edge of Wells Somerset. The public footpath will take you to the village of Dulcote. 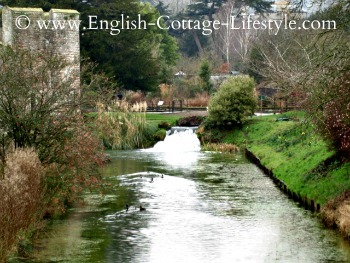 As you turn around the moat you can see the waterfall flowing from the wells that give Wells its name. 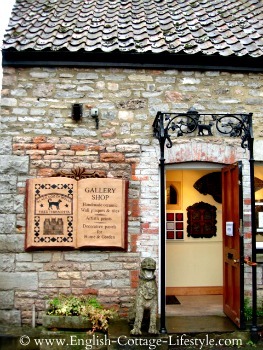 On the walk you will find the Black Dog Of Wells Somerset which is a hand made terracotta tile shop, they have a beautiful and whimsical collection that is worth a visit…You may find something special for your cottage. If all this walking is make you hungry or thirsty or if you want to warm up in front of a log fire then stop in at the Fountain Inn for a tipple or some lunch. We had a cream of broccoli soup to start and then salad and quiche while we warmed ourselves in front of the fire…Well, it is part of the walk! 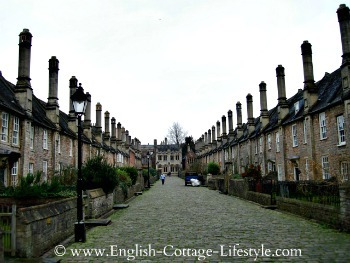 Vicars Close is the earliest continuously occupied street in Europe. The houses were built by 1368 for the Vicars Choral (deputy singers) who sang, and still do, in the Cathedral choir. 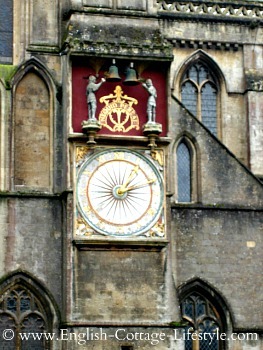 As you stay on the route you will walk by The Wells Clock installed by 1392 it has jousting knights which you can see from inside the Cathedral, when they rotate every quarter hour. The Wells museum and Visitor Information Centre is open daily and has many local hand-made gifts available. The museum has many interesting finds and is a good local museum. You can also find the largest collection of mediaeval statues in Europe at the west front of the cathedral. 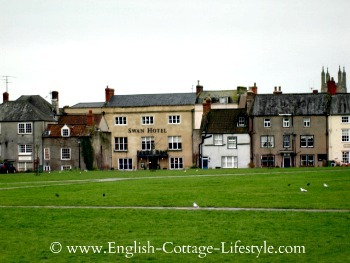 The walk ends on the Cathedral Green and the photo below shows its historical houses.